From the very first page, no, the very first paragraph, this story had me hooked. I don’t know if it was the terrifying premise – three women imprisoned in a cellar by a man they thought that they could trust; the unwavering loyalty to her friend Jennifer that the protagonist, Sarah, maintains despite the danger that in puts her in; or the three women’s determination, against all odds and all that had happened to them, to succeed in their quest for justice and uncover the shocking truth. Whatever it was, I just couldn’t put it down. One of the things that, for me, made the story seem so real was the voice of Sarah. A prisoner in her own home at the start of the book, she has to face her fears (and there are so very many of them) just to be able to leave her own building. She knows that she has allowed herself to be governed by fear, and that it’s far from normal, yet she has engineered a life for herself that allows her to work, to eat the food she likes and see her physiatrist without ever leaving the safety of her apartment. She is still a prisoner, only now it’s within her own home. And she is still receiving letters from the man who abducted her. Then she gets a call from the FBI telling her that the man responsible for her imprisonment, and her friend Jennifer’s death, is coming up for parole. The news spurs Sarah into action, setting her on a quest to not only keep her abuser in jail, but also to get justice for Jennifer by finding her body. It’s hard to go into any more detail without spoilers, all I’ll say is that Jennifer manages to reunite with Tracey and Christine, the other two survivors from the cellar, and re-enter the world inhabited by her abductor to seek out the clues, and the people, that the FBI failed to find. 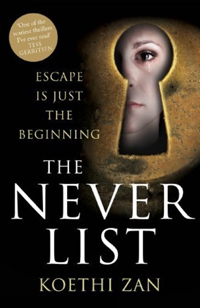 For their ‘Never List’ Sarah and Jennifer had imagined every terrible thing that could happen, and made a list of actions to prevent against them. At the creepy and heart-wrenchingly scary climax of the book, Sarah learns that sometimes the truth is even worse than the terrors in her imagination. A chilling, page-turner of a psychological thriller: a real must-read for all fans of the genre.